A lot of us, or our mothers, have a shoebox stuffed in the closet containing old photos and memories. Some of us even have these items strewn about our desk with nowhere to put them. The company 1000memories, which stores your family history online, wants you to put all of your paper memories into a digital “Shoebox” with its app. The service is primarily displayed as a place to share scans of physical photos, but I’ve found a few different uses for it. Since the camera has gotten better on iDevices, services like DocScan that let you “scan” documents with a photo have popped up. Shoebox‘s differentiator is the social sharing aspect, though, and isn’t focused on just storing receipts to expense later. I’ve found that I keep a lot of things that remind me of events I’ve attended, things I’ve done, and places I’ve experienced. I have stacks of ticket stubs, lanyards from conferences, and other physical items that probably should be placed in a box and stored. But I like remembering them, none the less. Shoebox lets you take a photo of these items, describe and label them, for safe digital keeping and sharing. The app allows you to crop and change the aspect ratio of the image, making it as flat as possible. Of course, taking a photo of the item from above will make sure it comes out great. The missing piece of this puzzle though is the ability to add your own descriptive tags manually. I’m not sure how 1000memories could have left this out of Shoebox, but they did. Right now, items are tagged by the title, date you enter, and the names of the people in the photo. A little more customization would make this product near-perfect. 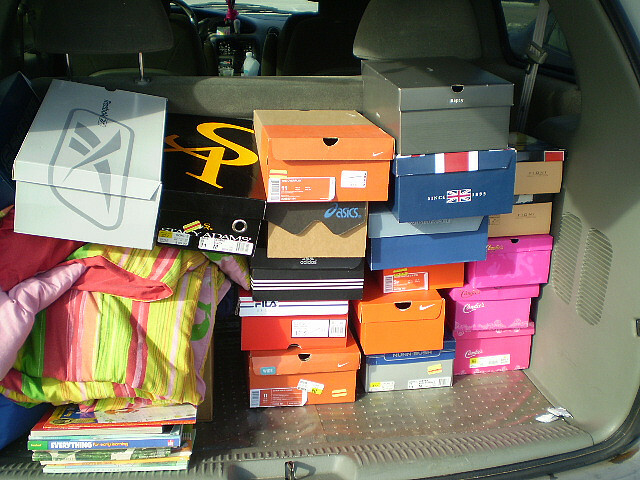 Instead of taking that Shoebox out of the closet, you can share your items publicly or with your family and friends. There’s no commenting or interaction here, which isn’t a bad thing necessarily. Not every service needs the ability to like something and say “wow that’s cool”. Shoebox is more personal than that. When you open the Shoebox app, you’ll see items that are featured. Right now they’re mostly old photos, but I did stumble on some old postcards and letters. I don’t know the story behind them and don’t really have to. It’s interesting just to see what people would store in their own digital Shoebox. While it’s not time to box up all of your stuff and throw it away, storing things in a place to share with others and review often is a great thing. Shoebox could add some more customization features like the tagging that I mentioned, but if you’re ready to clear your desk and closets of some things, the service is a great place to put them. Digitally, of course.